I am honored and humbled each day that I have the opportunity to work with you and your students at Collins Hill High School. Our school provides incredible opportunities for students to engage in their learning and grow into young adults that leave our halls with more than just a diploma. The staff at Collins Hill truly cares about students as individuals and works to support them daily in pursuit of their dreams. Our mission is to help our students develop their talents and stretch themselves while getting a world class education. In the area of Scholarship, our academic offerings include 26 unique Advanced Placement classes and currently two college level math classes on campus plus off campus Move on When Ready partnerships, as we want students to graduate with some college credits and/or experience as a part of their resume. If students are interested in specific pathways, we offer: Advanced Academic through our AP program; World Language in French, German, and Spanish; Fine Arts through our Band, Chorus, Dance, Drama, Orchestra, and Visual Arts; and several Career Technical pathways including Air Force ROTC, Computer Science, Careers in Education, Engineering, and Video/Film. If there is another particular area of technical study that we don’t offer on campus, students have access to half day programs at Maxwell High School of Technology and Grayson Tech. For students that prefer to build their resume through the world of work, we also offer Work Based Learning which provides valuable experience in the area of their choice. Service is a focus for our students to help them learn how to lead through service to others and be a part of something greater than themselves. All of our clubs and many of our athletic and co-curricular programs have students participate in community service activities, including volunteering in school programs for tutoring and mentoring other students, which helps weave a culture of inclusiveness at Collins Hill. The Spirit of Collins Hill is created when all of our students find a way to be engaged in their academics, fine arts, clubs, and athletic events either as a participant or a supporter and cheer each other on as they grow and develop as leaders in our community. It is my deepest desire for each of our graduates to be excellent communicators, collaborative problem solvers, and critical thinkers that are capable of adapting to our fast changing world and be a contributing citizen. Thank you for the role you play in supporting our students as they Soar to Success! 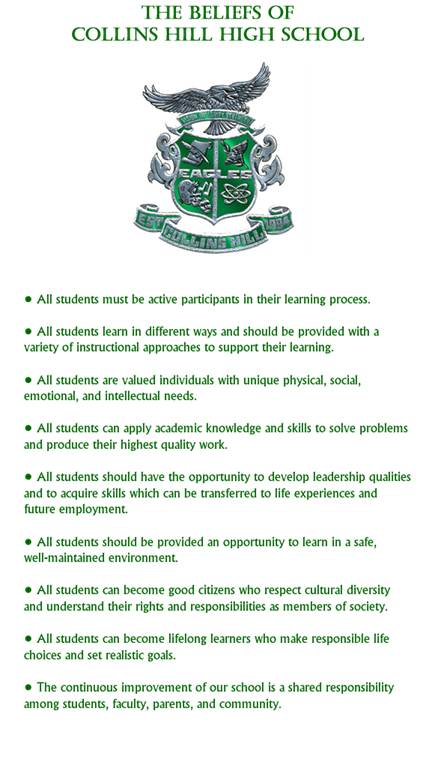 Mission: The mission of Collins Hill High School is to pursue excellence in academic knowledge, skills, and behavior by providing meaningful and diverse learning opportunities for preparing our students to meet the challenges of the future as lifelong learners and responsible citizens. Vision: Growing leaders for tomorrow through scholarship, service, and spirit. Click "View Larger Map" above to get directions. 1. Drive North on I-85 N.
4. Drive 1.4 miles, look for school on your right. 1. Drive South on I-85 S.
4. Drive 1.4 miles; look for school on your right.